When I interviewed Stephen West about Pioneer, I knew to expect great things. His positive attitude was infectious, and I could sense he saw lots of potential in our new California Wool Project yarn. But I could never have predicted Iberian Discovery. Made with six skeins of color Campfire, Iberian Discovery embodies the unique qualities of this very special yarn. It's rustic, but luxurious, elegant but richly embellished. The detail highlights the rich naturally-dyed colors, and rugged texture of Pioneer. Absolutely perfect. Stephen West released Iberian Discovery at just the right moment. Kristine has dyed more of some popular colorways in Pioneer, and the store is buzzing with preparation for Stephen's upcoming visit. 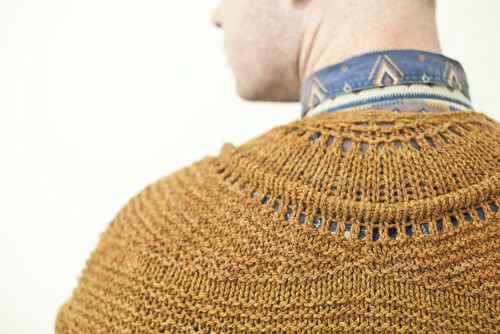 Did you know you can meet the man behind Westknits right here at the store, next weekend? You can get on the wait-list to come to the book signing, or you can sign up for any of the classes he's scheduled to teach. 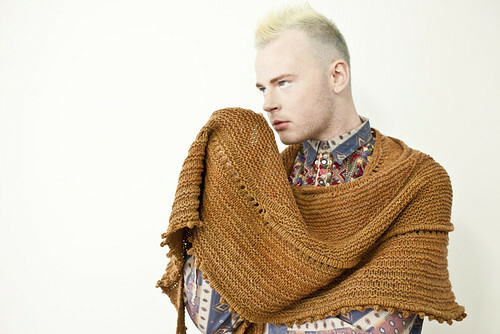 Have you ever wanted to learn how Stephen West designs shawls? Or his secrets for his incomparable colorwork? There's also his masters class, for those who want to investigate shape, construction, and drape. Sign up for a class and get a chance to work alongside Stephen on these techniques and more. Click here for Stephen's upcoming classes, and a complete list of the classes we offer at Verb. If you'd like to see all our available yarn, fabric, and fiber, including Pioneer, check the "Shop Online" page of our website. I love Stephen West! If I lived a bit closer and it was my day of I would totally road trip!